First published by HuffPost, 10 April, 2017. We are at a unique moment in history, when five economic trends are coming together into a Nexus Economy that is rapidly transforming our world for the better. The Resilience Economy includes all the defensive expenditures and investments that lower risks in society, from property insurance and health and safety controls to flood defences and emergency response training. The Stockholm Resilience Centre defines resilience as “the capacity of a system, be it an individual, a forest, a city or an economy, to deal with change and continue to develop. It is about how humans and nature can use shocks and disturbances like a financial crisis or climate change to spur renewal and innovative thinking.” As we enter a period of greater turbulence, we expect the resilience economy to grow as a strategy to survive and thrive. The Digital Economy includes all the technological expenditures and investments that increase connectivity and intelligence in society, from high-speed internet and The Internet-of-Things to MOOCs (massive open online courses) and artificial intelligence. The increased use of digital technologies could add $1.36 trillion to total global economic output in 2020, according to a recent study by Accenture and Oxford Economics (that’s the same size as the whole South Korean economy). The World Economic Forum calls this the Fourth Industrial Revolution and describes it as a “blurring the lines between the physical, digital, and biological spheres”, which is growing exponentially. The Access Economy includes all the expenditures and investments on shared services that increase efficient utilisation of assets, resources and capacity, from car-sharing (like Zipcar) and “couch surfing” (Air BnB) to entertainment streaming (Netflix) and crowdfunding (Kickstarter). The access economy (a term promoted by Harvard Business Review to suggest that customers increasingly want utilitarian value from accessing benefits from a product or service, rather than social value from intimate exchanges) is also known as the sharing economy, peer-to-peer marketplace, or collaborative consumption. PwC estimates the access economy may be worth $335 billion by 2025. The Circular Economy includes all the expenditures and investments that decouple economic growth from environmental impact by ‘closing the loop’ on resource and energy flows, from waste recycling and biodegradable plastics to renewable energy and biomimicry designs. The circular economy draws on an evolution of concepts and practices since the 1960s that include ‘spaceship earth’ thinking, eco-balance, life cycle analysis, industrial ecology, industrial symbiosis, cleaner production, eco-innovation and cradle to cradle. In the book Waste to Wealth, based on analysis by Accenture, the circular economy opportunity is valued at $4.5 trillion by 2030. The Wellbeing Economy includes all expenditures and investments that increase human health and happiness in society, from stress-relief practices and life coaching to plant-based diets and solutions to social diseases (like crime, inequality, suicide, domestic violence). There are various national indicators that have been created to demonstrate the limitations of economic growth as an indicator of progress in society, by measuring human wellbeing instead, such as the Social Progress Index, the Happy Planet Index and the OECD Better Life Initiative. As we become more conscious of the health impacts of lifestyle, consumerism, diet and pollution, the wellbeing economy is set to grow rapidly. Each of these economic trends have spawned an aligned business strategy in response to the opportunities that they represent. Each on their own is a strategy for future-fitness. 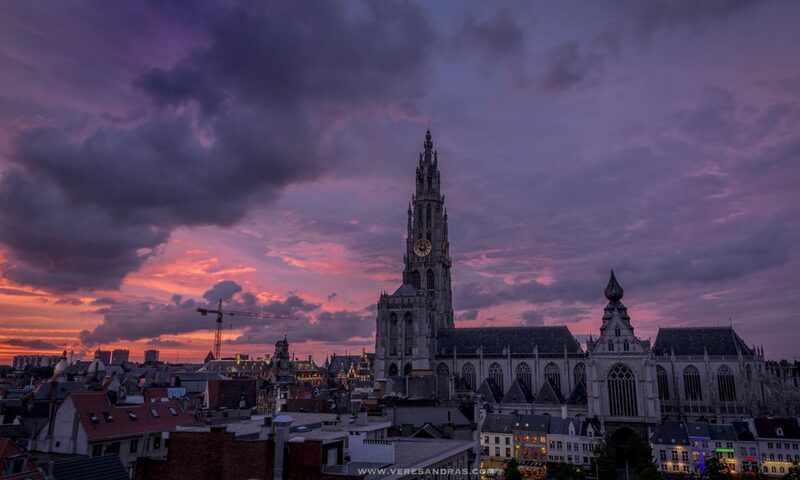 A Safe Strategy is one in which our organisations, communities, cities and countries do not damage our health and wellbeing; rather, they minimize our exposure to toxins, sickness, disease and danger, allowing us to feel physically and psychologically secure. The test question is: to what extent does your organisation protect and care for us, i.e. your stakeholders? Keywords are: healthy, secure, resilient. Example indicators include: occupational health & safety, toxicity, risk, and emergency preparedness. A Smart Strategy is one in which our organisations, communities, cities and countries use technology to better connect us to each other and allow us to share what we value most, and facilitate more democratic governance by allowing us (as customers or citizens) to give direct, immediate feedback. The test question is: to what extent does your organisation connect and empower us? Keywords are: educated, connected, responsive. Example indicators include: connectivity, access to knowledge, and R&D investment. A Shared Strategy is one in which our organisations, communities, cities and countries address issues of equity and access by being transparent about the distribution of value in society and working to ensure that benefits are fairly shared and diversity is respected. The test question is: to what extent does your organisation include and value us? Keywords are: fair, diverse, inclusive. Example indicators include: value distribution, stakeholder participation, and diversity. A Sustainable Strategy is one in which our organisations, communities, cities and countries operate within the limits of the planet by radically changing resource consumption and ecosystem impacts, with a shift to renewable energy and resources, closing the loop on production and moving to a low carbon society. The test question is: to what extent does your organisation protect and restore our environment? Keywords are: renewable, enduring, evolutionary. Example indicators include: externality pricing, footprint analysis, and renewability. A Satisfying Strategy is one in which our organisations, communities, cities and countries produce high quality services that satisfy our human needs, as well as enabling a lifestyle and culture that values quality of life, happiness and other indicators of wellbeing. The test question is: to what extent does your organisation fulfil and inspire us? Keywords are: beneficial, beautiful, meaningful. Example indicators include: quality standards, levels of satisfaction, and happiness. When an organisation, community, city or country pursues one of the 5-S strategies, they are making themselves future-fit. 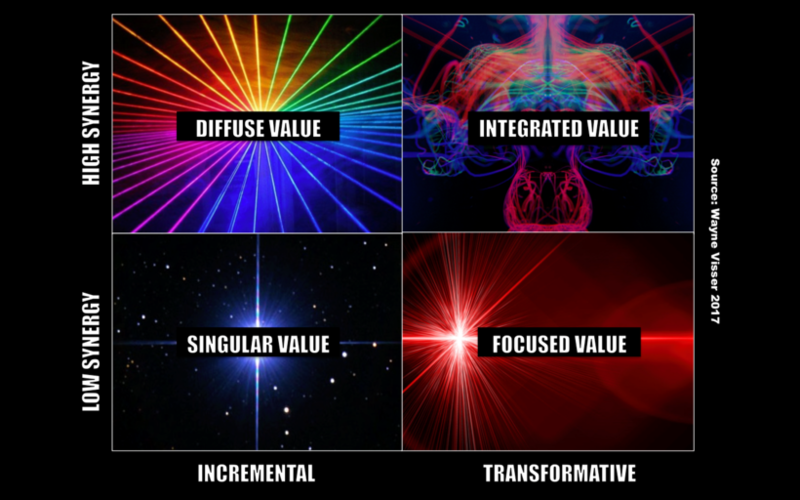 There are four strategic value-creation options available: singular, focused, diffuse and integrate value. Singular Value is when an organisation focuses on one of the 5-Ss as its strategic goal, but does so in an incremental way. This means they will have a management system (objectives, targets, programs, KPIs, reporting, audits, etc), but they are content to make a marginal contribution on the issue. The potential for synergy is low, because they are only focused on one S. For example, a chemicals company may decide that a Safe strategy is key for their success. Diffuse Value is when an organisation focuses on multiple of the 5-Ss as strategic goals, but does so in an incremental way. This means they will have a management system, but they are content to make a marginal contributions on the issues they have prioritised. The potential for synergy is high, because they are looking to leverage more than one S at a time. For example, a mining company may decide that a dual Safe and Sustainable strategy is key for their success. Focused Value is when an organisation focuses on one of the 5-Ss as its strategic goal, but does so in a transformative way. This means they will have a disruptive innovation approach, and they will only be content with rapid, scalable change on the issue, especially within their industry. The potential for synergy is low, because they are only focused on one S. For example, a food and agricultural company may decide that a Shared strategy is fundamental and they wish to completely transform the lives of farmers in their supply chain. Integrated Value is when an organisation focuses on multiple of the 5-Ss as strategic goals, but does so in a transformative way. This means they will have a disruptive innovation approach, and they will only be content with rapid, scalable change on the issues, within and beyond their industry. The potential for synergy is high, because they are looking to leverage more than one S at a time. For example, an electric car company may adopt an integrated 5-S strategy that takes Safe, Smart, Shared, Sustainable and Satisfying to a completely new level of performance. 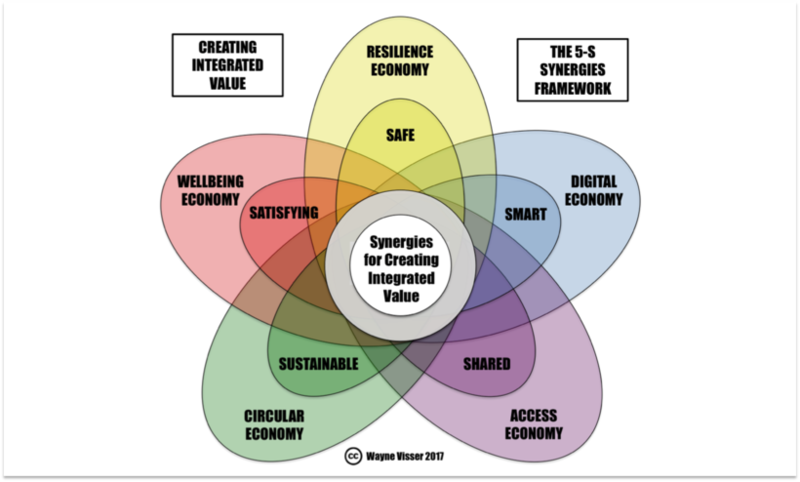 The way in which Integrated Value manifests – when more than one of the 5-S strategies is applied simultaneously in a transformative way – is through synergy, which American professor Russell Ackoff described in his studies of purposeful organisations as “the increase in the value of the parts of a system that derives from their being parts of the system”. We know this more commonly by the catchphrase: the whole is greater than the sum of the parts. Synergy is the driver of the new Nexus Economy and will be the key to competitiveness in the coming decade. 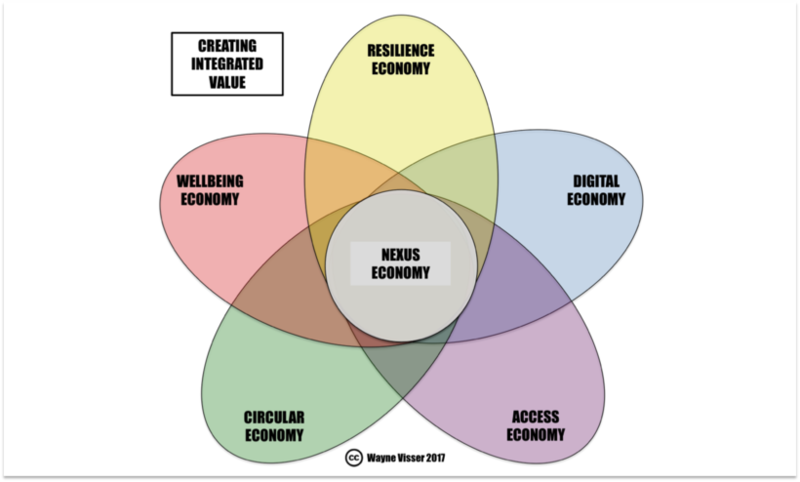 Visser, W. (2017) Synergy: The Driver of Integrated Value in the New Nexus Economy, HuffPost, 10 April, 2017.